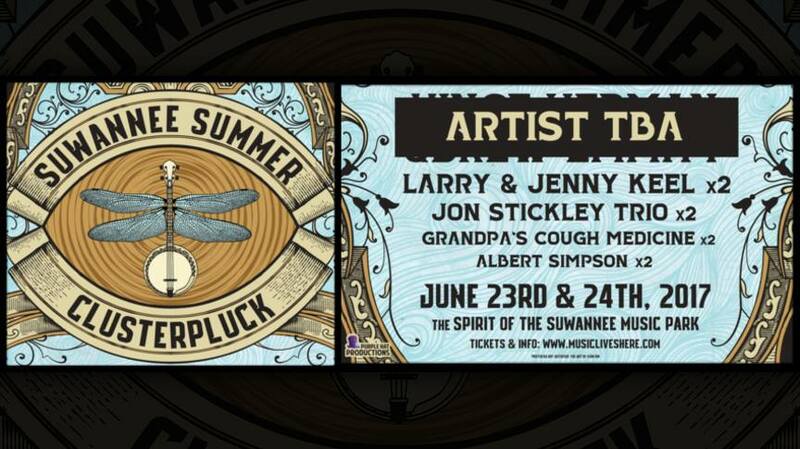 Purple Hat Productions and Spirit of the Suwannee Music Park (SOSMP) are teaming up on a spanking two-day gathering called Suwannee Summer Clusterpluck. The magical Spirit of the Suwannee Music Park in Live Oak, Florida, will host the event over June 23rd & 24th and will feature some of the best American bluegrass and new grass musicians touring today. The initial musical medley boasts progressive flatpicking guitarist Larry Keel and his wife Jenny Keel, the gypsy jazz/bluegrass stylings of Asheville’s Jon Stickley Trio, boundary breaking bluegrass outlaws Grandpa’s Cough Medicine, and solo multi-instrumentalist Albert Simpson. Each act will perform double sets at Clusterpluck, and fans can expect a healthy dose of sit-ins throughout the entire weekend as family, friends and musicians come together to participate in this joyous celebration of bluegrass music. Clusterpluck encourages its musicians to create a raucous foot-stomping good time with plenty of collaborations and surprises. Weekend passes with primitive camping and single day tickets are on sale now at www.MusicLivesHere.com. To join the waitlist for cabins, golf cart rentals and RV hook-ups, please contact SOSMP at (386) 364-1683. The park also offers guest comforts including a general store, a full-service restaurant, showers and water stations.